We thought we had it trimmed down enough right after Christmas, but he was still falling apart, so we(mostly Ben) whisked through and put lots more away. 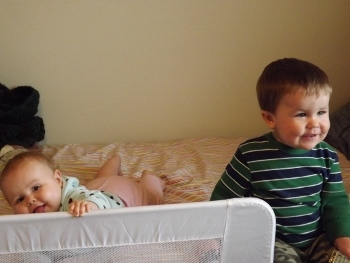 I was faintly protesting because it looked like everything was being put away, but I let Ben do his thing and sure enough, as soon as we were done Ascher was playing and we were all happier and more relaxed. And, when he does get bored with what’s out(it takes about three weeks) we rotate it out and it’s all new and happy again. My goal tends to be to have only one “big” category out at a time, with access to a variety of other things, made simpler with good storage and easy clean-up. 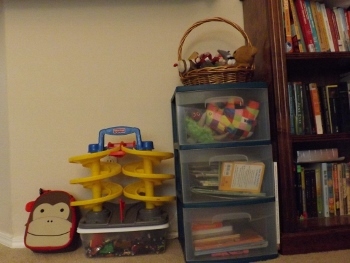 Having story books in a basket and a couple plastic drawers has proved to be much simpler than having them on a bookshelf. 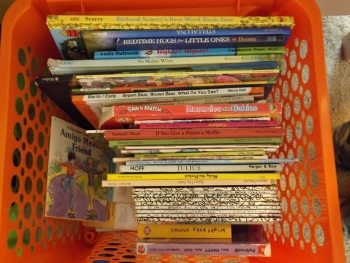 They still get dug through and dumped on the floor, but I think it’s harder to get them all out at once(having to actually lift them out, not just sweep them off the shelf) and SOOO much easier to just toss the books in the basket or drawer for clean-up than to try to line them up and get them to stand straight. This is approximately my goal amount of toys to be in the living room at any given time. Isn’t that marvelous? A few Legos in the monkey bag, the race track and cars, Wilona’s basket of toys, small stuffed animals and books in the drawers. 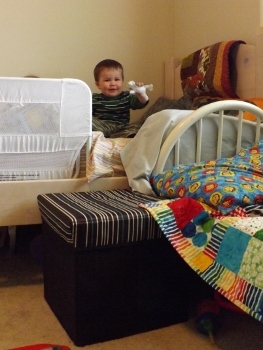 Ascher’s room is where the toy storage happens and since at this age he prefers to play close to us his room stays pretty neat. Ascher’s room. Books in the basket at the foot of his bed. 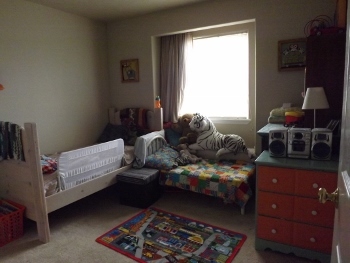 Fisher-Price stuff is under the bed, stuffed animals in the brown box. Fisher-Price Little People zoo and castle. Hot Wheels and race track. we always have lots of books and stuffed animals accessible, so we have super easy storage for them to keep the crazy level down. 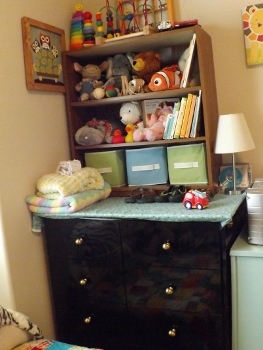 Books in drawers and a basket, animals in a storage cube/stool and a drawer and on bed and shelf. Book basket, in its most neat form. I always have a basket of baby toys out for Wilona to dig through. 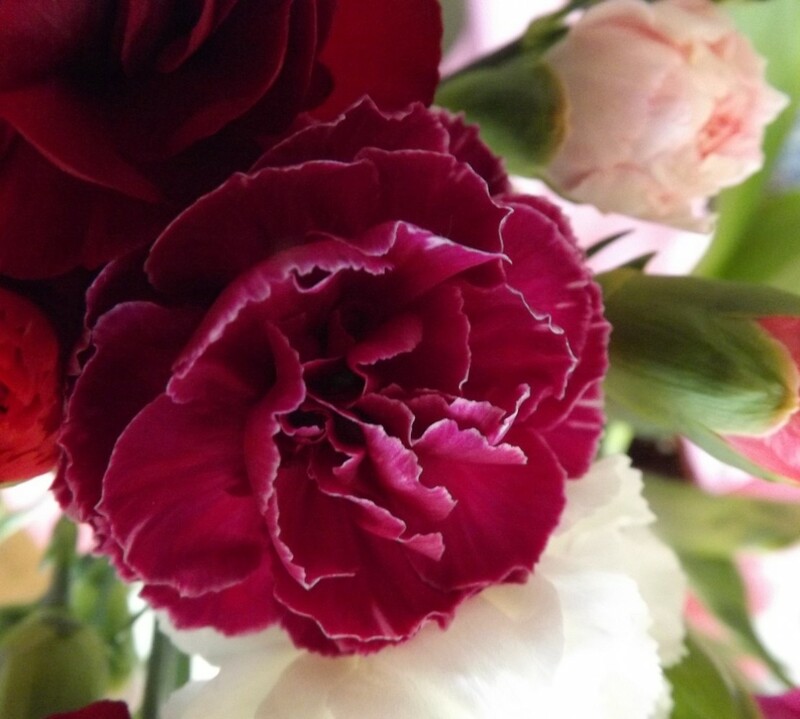 I rotate these too. I have a category of stuff that seems to be only interesting in short doses or is more fun to do with an adult. It includes shape sorting, puzzles, bead track, stacking rings/cups. I only keep one of these accessible at a time. Bookshelf gives some decorative, but out of reach storage on top of the dresser. crayons, chalk and playdoh are all supervision only, so they’re always out of sight/reach. there is a drawer of interesting containers and spoons in the kitchen for rummaging while I cook. Ascher seems to have outgrown it already, but I know Wilona will need it soon enough, so I’m leaving it be. 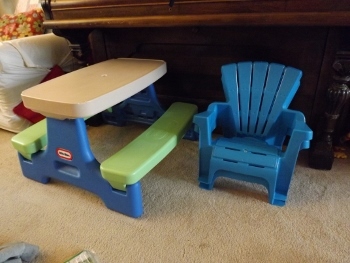 Play table and little kid chairs live in the living room. I found these tiny Adirondack chairs at Walmart last summer and Ascher loves them for watching Curious George. I’m not a tyrant about all this. If Ascher spies a toy that he’d like to play with I almost always get it out or down for him, I just make sure to trade it with something that is out to keep from overwhelming. 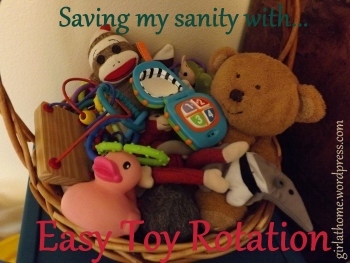 Have you done any sort of toy rotation? 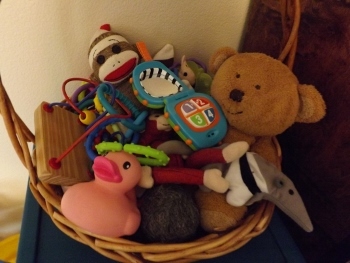 What tips do you have to streamline toy clean-up?